Scientists from the United Kingdom and Germany have undertaken studies on magnetic nanovortices present in magnetite minerals. They reveal that these structures are reliable witnesses of the earth's history. The structures are constructed in the molten rock cooling process, and during their formation the magnetic structures reflect the magnetic field of the earth. Electron holographic experiments in Jülich have established that the vortices are extremely adaptable to fluctuations in the temperature. These findings play a vital role in enhancing the understanding of the history of the earth’s core, magnetic field, and plate tectonics. The earth's magnetic field carries out significant functions, like protecting human beings from charged particles from space, and helping the navigation of bees, migratory birds, and other animals. However, the earth's magnetic field is not stable and regularly changes its state and intensity. In the past, the earth's magnetic field even changed its polarity - the north and south poles have changed place. Scientists specializing in paleomagnetism use magnetic minerals to examine the history of the earth's magnetic field, and its creation from molten metal traveling with the core of the earth know as geodynamo. These rocks can be used to observe the movement of continental plates. During the course of millions of years, these minerals could have been exposed to increased fluctuations in temperature, due to extreme volcanic activity or climate change, for instance. Recently, an international team of researchers analyzed how efficiently the magnetic structures survived such fluctuations in temperature. The team also studied the reliability of the information obtained from these structures. All of these investigations were carried out for the very first time at extremely high resolution on magnetite samples, as this mineral overpowers the magnetic properties of the crust of the earth. It is only in a small part of naturally occurring magnetite that magnetic structures known for being very stable with respect to temperature fluctuations are found. Far more common are tiny magnetic vortices. Their stability could not be demonstrated until now. 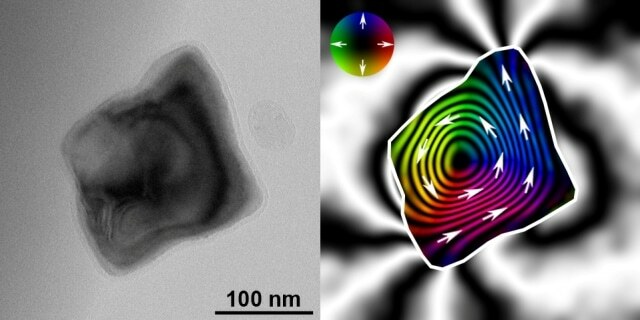 Almeida, along with colleagues from the University of Edinburgh, Forschungszentrum Jülich, and the University of Nottingham analyzed the magnetic vortices present in magnetite nanocrystals. The magnetic structures are so small that every single grain resembles the size of a virus, and this is the reason for the existence of only one technique that can be used to directly observe the nanovortices while they are heated and then cooled. A special high-resolution electron microscope at the Ernst Ruska-Centre (ER-C) in Jülich is capable of making magnetic fields on the nanoscale holographically visible. In this way, images of field lines are produced almost like using iron filings around a bar magnet to make its magnetic field visible, but with a resolution in the nanometre range. The experiments executed in Jülich highlighted that the magnetic vortices are capable of getting back to their original state when they are cooled, even though they change in direction and strength when heated. "Therefore magnetite rocks, which carry signs of temperature fluctuations, are indeed a reliable source of information about the history of the earth," enthuses Almeida. Electron holography has made it possible for us to gain a completely new insight into the magnetic behaviour of magnetite. Weak magnetic fields in nanocrystals don't just play a role in paleomagnetism. In information technology, for instance, electron holograms can also be of use to help to push back the physical limits of data storage and processing.